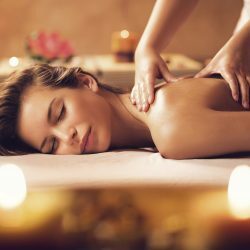 Deep tissue massage is a style of massage that is designed to get into the connective tissue of the body, rather than just the surface muscles. A variety of techniques to deeply penetrate the muscles and fascia, loosening them and releasing tension. Many clients have a more intense experience with a deep tissue massage, but also feel that it is more beneficial, because it addresses deep-seated muscle pains. Like other types of massage, deep tissue is most beneficial when undertaken on a regular basis, so that therapist and client can work together to correct long term problems, relax the body, and prevent injury. Should you have any questions about getting a Deep Tissue Massage with us, please call us at 403-452-7899, email us here, or drop by our Panorama Hills location. We would be happy to consult you on your needs. I have been visiting Peace of Mind Massage since the Fall of 2010. I currently receive deep tissue massage and have been helped immensely. Before coming to Peace of Mind I felt everyday that I needed a massage. Since coming to Peace of Mind I am able to go almost a full two weeks feeling good and not experiencing the headaches that I had on a daily basis before. It is absolutely wonderful. I have also been utilizing BodyTalk for over a year now which has helped me out with all types of health and emotional issues. The sense of relief I feel after having BodyTalk is great. The staff and owners at Peace of Mind always make me feel like I am important. I would recommend Peace of Mind to any of my friends. As a matter of fact I have done that already! Cathie T., Customer Service Rep.
Know someone who would benefit from a deep tissue massage?